I have tried a few of Carol's Daughter products. I like this hair butter. It is not very greasy and it really conditions my hair. 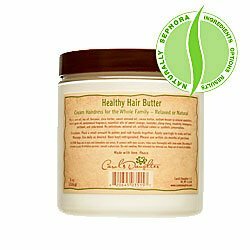 I have natural hair with coloured ends and I usually put some of this butter on my scalp and then braid it over night. In the morning my hair looks lovely and soft and very manageable. I have been using this for a little over a week, and the change in my hair is amazing! It's much softer and looks fuller than it had been looking, and the dry ends are much less noticeable. I color my hair, so it had been getting over-processed and brittle. This is another must have from Carols Daughter. on the ends and shaft. Be patient the more you work the Heathy Hair Butter in the better the end results. Using a wide to comb to begin I can gently pull a comb though my hair with barely a snag. This product smells great....and is a good product, but if you have extremely curly hair (and I mean Ophrah curly) the ojon treatment in a jar is far better in terms of giving your hair moisture and a good "drink" if it is really coarse and dry like mine is, but that smells like burnt coffee...still I use them both but have to say I prefer the Ojon products from QVC much more. Everyone's hair has different needs....just keep this in mind if you have hair that is as curly as mine. My hair ritual now consists of shampooing with Mizani BotaniFying Conditioning Shampoo, conditioning with DRC-28 under a hooded hair dryer for 30 minutes, conditioning again with Mizani Moistufuse Moisturizing Conditioner under a hooded hair dryer for 15 minutes and using a small amount of Carol's Daughter Healthy Hair Butter before sitting under a hooded hair dryer to allow my hair to dryer. After my hair dries, I flat iron my hair with a ceramic iron that gets up to 450 degrees. I use Mimosa Hair Honey daily. All products that I listed above are what my stylist was using in my hair. I was using all of the products at home except for the Carol's Daughter. I didn't realize that this was the product that my stylist was using in my hair until a friend pointed it out; however, I did recognize the smell, which I am not wild about. I'm sure this is why I could not achieve the silkiness that I was getting from my stylist. Now, that I have the Carol's Daughter products my hair feels like it does when I leave the salon. It made my hair feel a little waxie. but it did give my curls great bounce!! Awesome Hair Creme!! TWO VERY HAPPY CUSTOMERS!!!! The texture of the product was not creamy enough to just put it on my hair. I felt it caused too much friction for my hair. I had to place the product in my hands and rub it to create a lighter texture. Actually, this procedure is probably used with other products. It is just that this particular item is just too heavy and thick. It is parabens-free and Propylene Glycol-free which is why it gets 4 starts instead of 3.
great product... a must buy!